President Donald Trump and first lady Melania Trump ventured to the U.S. Capitol on Monday night to pay their respects to former President George H.W. Bush, who died last Friday at the age of 94. The pair visited Bush's casket, which is lying in state in the Capitol Rotunda through Wednesday morning. They stood in silence, side by side, in front of the flag-draped casket for a minute and then the president saluted and the first lady placed her hand on her heart. Two minutes after arriving, they turned and exited the Capitol. 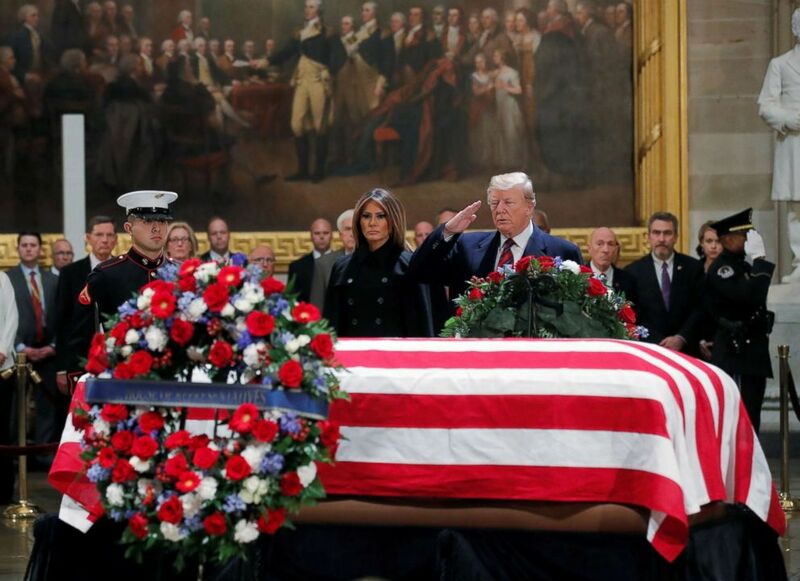 President Donald Trump salutes, as he and first lady Melania Trump pay their respects at the flag draped casket of former President George H.W. Bush, as it lies in state inside the U.S. Capitol Rotunda in Washington, Dec. 3, 2018. The president tweeted on Monday morning that he also plans to visit privately with members of the Bush family. The White House did not immediately respond when asked by ABC News for further details about the president's visit. Looking forward to being with the Bush Family to pay my respects to President George H.W. Bush. Trump officially informed Congress of Bush's passing on Monday morning. "With his passing, we mark one of the last pages of a defining chapter in American history," Trump wrote, describing Bush as "fearless, courageous, adventurous and unyielding." While the president's public statements in the wake of Bush's passing have been marked with respect, he declined to respond on Saturday in Buenos Aires when asked by reporters whether he had any regrets about his past statements insulting the Bush family. Trump's long-running feud with the Bush family peaked during the 2016 campaign as he regularly mocked Jeb Bush in the GOP presidential primary. Long before that, however, Trump was a frequent critic of his brother George W. Bush and at one point described him as the "worst" president in U.S. history. 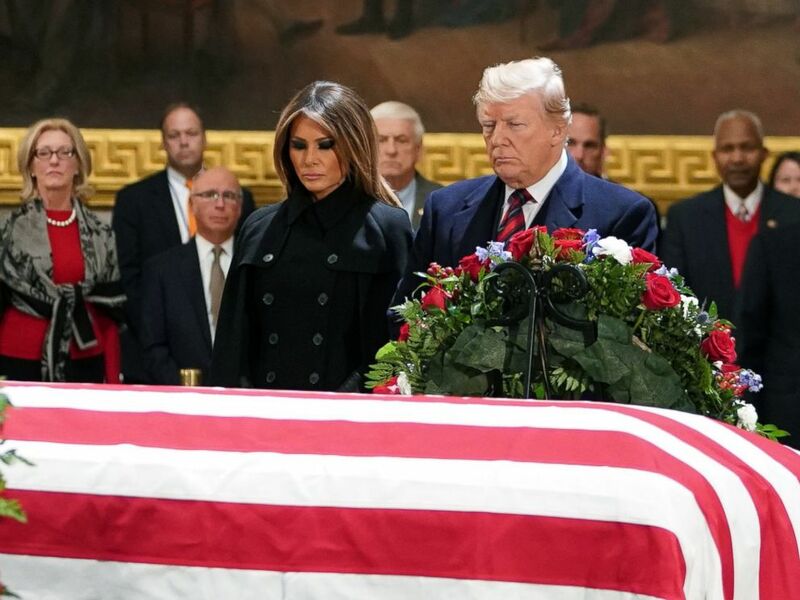 President Donald Trump and first lady Melania Trump pay their respects as former president George H. W. Bush lies in state in the Rotunda of the US Capitol in Washington, Dec. 3, 2018. George H.W. Bush's state funeral will be the first public interaction between Trump and the Bush family since his inauguration. First lady Melania Trump attended Barbara Bush's funeral last year, while the president decided not to attend, in order to avoid the further disruption of a heightened Secret Service presence. Trump said Saturday that he spoke over the phone with former President George W. Bush and Jeb Bush to offer both his condolences, and has several times since Bush's passing lauded the former president calling him a "truly wonderful man."